What is February Heart Health Month? Around the world, the month of February is designated for heart health. The British Heart Foundation, American Heart Association, and other health organisations and professionals all use this month to raise awareness of the importance of heart health. For example, the American Heart Association’s February messaging stresses the seriousness of cardiovascular disease, which includes heart disease and stroke. An estimated 1 of every 3 deaths in the United States, or 801,000 deaths annually, are associated with cardiovascular disease. Tobacco use and exposure, harmful use of alcohol, too little physical activity and/or an unhealthy diet increase one’s risk of dying from an NCD. Other causes of NCDs include “rapid unplanned urbanization, globalization of unhealthy lifestyles and population ageing.” All people, ages and countries are affected by NCDs. However, low- and middle-income countries have the greatest burden on NCDs. Over 80% or 31 million premature deaths in low- and middle-income countries are attributed to NCDs. How can we promote a heart-healthy lifestyle? Although these statistics are grim and the picture may seem bleak, we can all do small things to foster a heart-healthy lifestyle for ourselves and family. Addressing the risk factors is imperative. Seek help to quit using tobacco products. Dine at ‘smoke-free’ restaurants. Reduce alcohol consumption, and seek help if needed. Engage in physical activity – walking, running, biking, swimming or playing sports (or anything else that gets you moving). Instead of using the escalator or elevator, climb the stairs. According to the American Heart Association, “the simplest, positive change you can make to effectively improve your heart health is to start walking.” Lastly, the World Health Organization recommends that a healthy diet consist of fruits, vegetables, whole grains, legumes and nuts. Limit sugars, salts and fats. Most countries have their own prescribed dietary guidelines. Please seek out your country’s dietary guidelines for more details, and for specific recommendations pertaining to the elderly, infants and young children. Sometimes changing our behaviours isn’t enough. 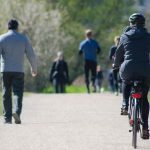 Communities and workplaces have significant influence over the environments that we live and work in, and can help make them healthy or unhealthy. To learn more about how to make your community or workplace a healthier environment, read about C3’s community engagement and workplace health programmes. Want quick heart-healthy steps you and your organisation can take today? 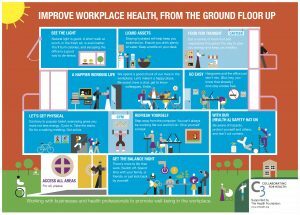 Download C3’s workplace health infographic for ideas! Heart Disease and Stroke Statistics 2017 At-a-Glance. Healthmetrics.heart.org. 2017. https://healthmetrics.heart.org/wp-content/uploads/2017/06/Heart-Disease-and-Stroke-Statistics-2017-ucm_491265.pdf (accessed 30 January 2018). Non communicable diseases. World Health Organization. 2017. http://www.who.int/mediacentre/factsheets/fs355/en/ (accessed 30 January 2018). American Heart Association Recommendations for Physical Activity in Adults. Heart.org. 2017. http://www.heart.org/HEARTORG/HealthyLiving/PhysicalActivity/FitnessBasics/American-Heart-Association-Recommendations-for-Physical-Activity-in-Adults_UCM_307976_Article.jsp#.Wm9h_kxFzIU (accessed 30 January 2018). Healthy diet. World Health Organization. 2015. http://www.who.int/mediacentre/factsheets/fs394/en/ (accessed 30 January 2018).